Forensic Dynamics Inc. has extensive experience with incidents where the public are supposed to be having fun. Unfortunately, all too often these types of events, which are supposed to be associated with outdoor recreational activities and life enjoyment, end up with disastrous results. Typically, recreational incidents are difficult to analyze because much of the physical evidence we would rely on in a motor vehicle accident on a roadway is not left behind in the same manner, if at all. FDi has extensive experience and numerous techniques for reconstructing atypical recreation-related incidents. Common cases include, but are not limited to, the following subject matter. When it comes to vessel collisions at sea, there are no skid marks or gouges to assist in the determination of who was doing what and where. For these types of cases, Forensic Dynamics engineers use their extensive personal and professional knowledge of seagoing vessels (the lead engineer is a registered pleasure craft operator and has owned/operated a host of personal water craft and recreational boats over the past 20 years) in order to determine what may have transpired. This typically involves a thorough inspection of the hull of the subject vessels in order to establish the angle of impact and speed of impact. Tests are often performed with surrogate vessels identically laden and with similar props in order to determine the performance curve of the subject vessel, along with the associated draft. 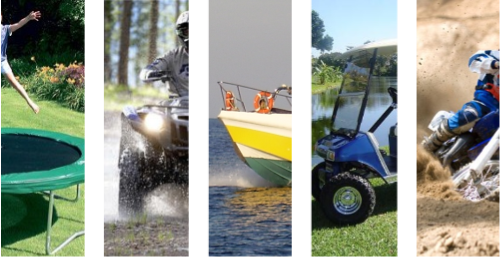 When it comes to ATVs and off-road motorcycles, numerous cases involving these types of recreational vehicles have been undertaken. FDi engineers, many being motorcycle and ATV owners themselves, once again draw on personal knowledge of these vehicle dynamics as well as research papers and studies to determine the most reasonable sequence of events. To supplement our knowledge and research, we will perform specific tests to determine such factors as the braking capability of four-wheel or quad vehicles, for example, or the rollover propensity of certain off-road vehicles compared to those of other competitive brands. We have been retained on many cases to inspect and reconstruct the vehicle dynamics of golf carts on golf courses throughout North America. Differing greatly from typical passenger vehicles and roadways, golf carts and golf courses present unique characteristics and consequently require an in depth investigation. For example, the use of a radar gun may be required to determine the maximum capable speed of a golf cart travelling down a steep grade and friction testing maybe required to determine the maximum stopping capabilities of a cart on a wet grassy surface. We will also inspect the involved cart for any signs of mechanical failure, i.e. the rear brakes, steering mechanism, speed governor, to name a few. In the case of golf cart rollovers, the cart's centre of gravity height will require measurement and the scene will require surveying to accurately determine the rollover potential for the involved cart. On occasions we have been asked to conduct investigations into the circumstances surrounding trampoline accidents and provided opinions with respect to the safe practices of this sport. These investigations entail inspecting the involved trampoline and commenting on whether its condition at the time of the accident would have met ASTM standards and analyzing the physics involved in the sport. Finally our biomechanical engineers are asked to comment on the potential for injury and whether or not the injury received could be associated with this sport. While each recreational incident is different, one thing remains clear: Forensic Dynamics will do whatever it takes (setting up a research program, obtaining an exemplar unit, or performing specific tests) in order to determine precisely how, when, where, and if an incident occurred.